It's official, Awesome Animals are a hit! Kids all over are diving into these frantically funny, easy-to-read chapter books and they can't wait to find out what new tricks these hilarious animals will be up to next. 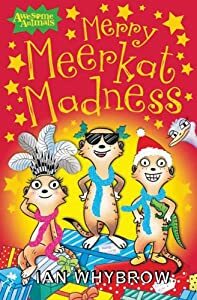 Merry Meerkat Madness is a hilarious holiday adventure and a must-read for little meerkat fans. It's Christmas in the Kalahari and the Really Mad Mob of meerkats are about to have a very Merry Meerkat Christmas! This brand new title in the Awesome Animals series is certain to keep kids laughing and reading! Comical black and white cartoon-style illustrations capture the zany spirit of the story. I have had the opportunity to now have read three of these Meerkat stories and each one just keeps getting better. Though it is still July now, I have to say that this story truly put a smile on my face and had me laughing throughout the entire book. What constitutes a Merry Christmas in the Kalahari is somewhat different than what I see around the holidays, but just as humorous. These characters are so memorable and you completely get drawn in by the great story and the unique aspects of each of the characters that make the story as amazing as it was. This is another great addition to the series of Meerkat books and I for one hope that there are many more to come!